Auckland Ace Jamie Brown in action. He took 4/26 in the T20 final. Photo Jim Allnatt. A comfortable win over Grafton has put the Marie Raos Ray White HPCC Premier Men in line to qualify for top spot in the semi-finals. Currently leading the table by three points, a win in the last round over a very strong University side will see the team hosting a home semi-final. 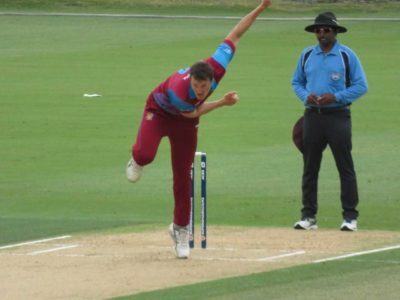 On Saturday Grafton won the toss and batted on a perfect Lloyd Elsmore wicket and very quickly piled the runs on at the rate of six an over in the face of an all-Aces opening attack of Jamie Brown, Danru Ferns and Matt McEwan. The first wicket fell at 58 followed by another at 94 but by this stage the Howick bowlers had settled down and, backed up by some superb fielding, put pressure on the Grafton batsmen. Apart from a defiant 56-run stand between Snedden and Ruffell, wickets fell regularly. Adam Jones bowled unchanged in his 10-over spell taking 4/32 and Danru Ferns came back at the death to claim 3/52. After its 50 overs, Grafton had been dismissed for 207 which was never going to be defendable on the Lloyd Elsmore wicket which had dried out nicely during the day. Howick Pakuranga did lose both its openers with the total at 6 and 40. But with Andrew Morrison scoring 86 off 84 balls and Brian Barnard 88* off 70 balls including his usual quota of sixes (4), the match was taken away from Grafton very quickly. Howick Pakuranga scored the winning runs in 31 overs finishing on 208/3, winners by seven wickets. The Marie Raos Howick Ray White Pakuranga Premier Reserve Men had a convincing win over Eden Roskill dismissing their opponents for 74 in 21 overs and running up 78/2 in 10 overs to win the match by 8 wickets. Taine Jolley returned the club’s best figures of the day with 6/14, which illustrates the depth of the Club’s bowling stocks. None of the batsmen really had a chance to settle into an innings – with such a small total to chase – but Brandon Laurenzi still managed time to score 31. Currently the Reserves lead both the Two Day and One Day competitions and are in with a real chance of promotion.